This year, one of my major New Year’s Resolutions was to declutter my entire house. I find moving to be one of the best ways to declutter–you really are willing to get rid of stuff if it means you don’t have to move it. We haven’t moved in 6.5 years and don’t plan to basically ever, so I can’t rely on the move to get rid of the clutter. A little stronger than my need to save things “just in case” is my desire for things to be clean. I like my life macro clean. I do also clean on a micro level, but that is a means to an end because having things micro clean means my macro clean is possible. (see my post on macro vs. micro cleaning if you are wondering what on Earth I am talking about). There is a bit of a “fad” going on right now surrounding (affiliate link) The Life-Changing Magic of Tidying Up: The Japanese Art of Decluttering and Organizing by Marie Kondo. I have friends who have read it, applied it, and absolutely love it. Here is the thing, those friends are all 100% friends without children. One of the big suggestions in this method is to do it all at once, not slowly over time. Well, that sounds nice and I see the point, but there is no way I ever have a day long enough and free enough to do all decluttering in one day with my four children. Maybe if I make it a point of decluttering every year once I have finished this 6 year purge (not a bad idea), but not possible right now. Right now, my time is limited to about 2 hour spurts at a time and usually just once a day. So for me and my decluttering, I have to take baby steps. I have chosen to tackle one room each month. At the beginning of each month, I will figure out how to break up each room into smaller goals that can be accomplished in my 2 hour chunks. We are nearing the end of January and I have already finished room one, which included my bedroom, bathroom, and closet. Pretty good! Now for some tips on the bedroom front. When you are deciding whether or not to keep something, you absolutely cannot keep more than you have space for. If you do, things will be messy. The easiest way to keep a house clean when you have limited time available for cleaning is for everything to have a spot and to not have more than you have space for. If you want to make life even easier on yourself, get your stuff down to where you have a little extra space. You might be able to squeeze every shirt into your closet, but if you get rid of 5-10, you will have more room for your clothes and you will find it easier to quickly put things away. It is really easy to look through your clothes and think, “Yes, those are all things I like enough to keep.” Don’t do it that way. Literally take everything out of your closet. I did one rod of clothes at a time. As you put it back, decide if it is really worth keeping. Do you love it? Have you worn it recently? Is it in style enough you are willing to wear it in public? Is it flattering? If you aren’t sure, try it on. Only put the things back in your closet you think you might actually wear. 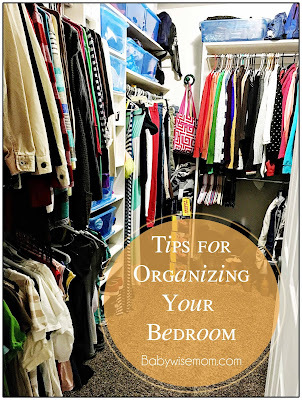 Do the same thing with your nightstand drawers, your socks, your underwear, your shoes, your bookcases, your make-up…just remove everything, wipe out the drawer or shelf, and then add it back in if you still need it. I also give myself a number of what would be ideal to keep. The number will vary from person to person and from type of shirt to type of shirt. So I will look at my sweaters and think, “14 is enough. Then I can basically only wear a sweater twice a month.” 14 is a great number for keeping the wardrobe interesting. Some might like more, some might like fewer. Choose a number and start by putting your favorites to fill that number. After that number, only add them back to the closet if you LOVE it. You can do this for things like socks. You might think, “Oh that hole is fine.” If you have 20 pairs of socks, you probably don’t need to keep the socks with the hole in them. I like to put my clothes together by type. All of my sweaters are together. All cardigans are together. All short-sleeved shirts are together. All long-sleeved shirts are together. All sweaters are together. All jeans are together. All dresses are together. All skirts are together…you get it. I also organize by color. I started this in high school. When I worked retail in high school, we organized clothes in a certain color order. They are more pleasing to the eye that way. There are different psychologies on how to organize based on the age of your target clientele. I just keep it simple and go by the rainbow–it is something I can remember. I do red, pink, orange, yellow, green, blue, purple, brown, cream, black, gray, white. I do darker shades of each color and work to the lighter shades. I started my clothing purge by doing a soft removal. I got rid of everything I knew was an absolute no go. This is easier when you are past the “I am 10 different sizes every 2 years” phase of life. Let’s be real, being pregnant, nursing, losing baby weight, getting in shape, getting pregnant, nursing, etc. over and over means you have a lot of different clothes that look better on you at different times. A shirt that is flattering when you are nursing a baby isn’t necessarily going to look good when you are not more endowed. I am a at a point where I am more stable in my body size, so I can with more confidence get rid of things. So keep that in mind as you are going through clothes. I want to also know what I am wearing or not. I might think I will wear it and then never be willing to put it on when it comes time to get dressed. A couple of years ago, there was a great idea circulating Pinterest. It is to hang your hangers backward. As you wear the item, you turn the hanger the correct way. Then you can see after a period of time what you wear and what you don’t. We all have clothes we know we look good in. We all have others we aren’t so sure about. Save the “not so sure about” for days you will be home for the whole morning. Then you can put it on and see how it looks through the day. See how it looks as the day goes on. If it isn’t flattering, there just isn’t a point in keeping it. Even a cute shirt might not look cute on you. The colors might be wrong and the fit might be wrong. I have two daughters who are the same height (different by only 1/4 of an inch) and same weight (different by 1 pound). They have different coloring, though, and different builds. I have only been asked if they were twins one time EVER. I have been asked if Brayden and Kaitlyn are twins way more times than that, and they have never been close to the same height. These two girls look very different in the same clothes despite being the same size. What looks fantastic on one rarely looks fantastic on the other. It has been a real eye opener for me that it isn’t about size or weight–body type really does have a ton to do with what you look good in and what you don’t. So my point is, don’t keep something because it is so cute you think it should look good on you. If it doesn’t find a friend it will look great on and feel happy seeing her wear the cute thing. My plan is next December, if a hanger never was turned around, the clothes will be donated. I live in a place where we have very distinct seasons and temps range from below 0 to above 100. That is why I am giving myself a year. As you move forward now that things are clean, as you buy new things over time, don’t add it in without getting rid of an older piece (unless you really need more quantity and have the space for more). This post contains affiliate links. The space under your bed is a great place to store things. We keep extra blankets under our bed. We also keep our wrapping paper under our bed. Use the space, but don’t abuse it. Don’t over fill it or you won’t be able to get to it again or you will forget half of it is there. I really like to use these short Rubbermaid totes to put things that are similar together under the bed. Drawer organizers are fantastic for keeping things organized. I used these drawer organizers in our bathroom and I LOVE them. I can take them out and wash them in the dishwasher every so often to keep them clean. I use similar things in my nightstand drawers to keep things organized. If everything has a place in the drawer, it is fast and easy to put things away. It is also fast and easy to find things when you need to. We use drawer organizers in all of our children’s dresser drawers. I also use drawer organizers for my makeup. I really like the space definition! Baskets are another great way to keep things together and organized. Take some time to make sure your room is decluttered. You want your room to be a place that can stay clean so it is a place where you can go and relax at the end of the day (or in the middle!). It can be your happy place where you rejuvinate and prepare yourself for the work that is sure to come the next day.